Line a large baking pan with parchment paper. 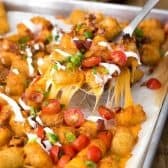 Place Tater Tots in a single layer and bake 20 minutes turning after 10 minutes. Top with bacon, sausage and cheddar cheese. Bake an additional 5 minutes or until cheese is melted and bubbly. Remove from the oven and top with tomatoes, green onions and sour cream. Serve immediately.